The effects of high altitude on humans are considerable. The percentage oxygen saturation of hemoglobin determines the content of oxygen in blood. After the human body reaches around 2,100 m (7,000 feet) above sea level, the saturation of oxyhemoglobin begins to plummet. However, the human body has both short-term and long-term adaptations to altitude that allow it to partially compensate for the lack of oxygen. Athletes use these adaptations to help their performance. 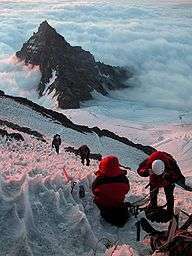 There is a limit to the level of adaptation; mountaineers refer to the altitudes above 8,000 metres (26,000 ft) as the "death zone", where it is generally believed that no human body can acclimatize. The human body can perform best at sea level, where the atmospheric pressure is 101,325 Pa or 1013.25 millibars (or 1 atm, by definition). The concentration of oxygen (O2) in sea-level air is 20.9%, so the partial pressure of O2 (pO2) is 21.136 kPa. In healthy individuals, this saturates hemoglobin, the oxygen-binding red pigment in red blood cells. Atmospheric pressure decreases exponentially with altitude while the O2 fraction remains constant to about 100 km, so pO2 decreases exponentially with altitude as well. 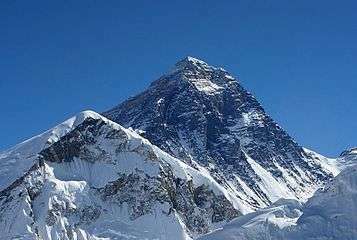 It is about half of its sea-level value at 5,000 m (16,000 ft), the altitude of the Everest Base Camp, and only a third at 8,848 m (29,029 ft), the summit of Mount Everest. When pO2 drops, the body responds with altitude acclimatization. Travel to each of these altitude regions can lead to medical problems, from the mild symptoms of acute mountain sickness to the potentially fatal high-altitude pulmonary edema (HAPE) and high-altitude cerebral edema (HACE). The higher the altitude, the greater the risk. Research also indicates elevated risk of permanent brain damage in people climbing to extreme altitudes. Expedition doctors commonly stock a supply of dexamethasone, or "dex," to treat these conditions on site. Humans have survived for two years at 5,950 m (19,520 ft, 475 millibars of atmospheric pressure), which is the highest recorded permanently tolerable altitude; the highest permanent settlement known, La Rinconada, is at 5,100 m (16,700 ft). At extreme altitudes, above 7,500 m (24,600 ft, 383 millibars of atmospheric pressure), sleeping becomes very difficult, digesting food is near-impossible, and the risk of HAPE or HACE increases greatly. The summit of Mount Everest is in the death zone. The death zone, in mountaineering, refers to altitudes above a certain point where the amount of oxygen is insufficient to sustain human life. This point is generally tagged as 8,000 m (26,000 ft, less than 356 millibars of atmospheric pressure). The concept of the death zone (originally the lethal zone) was first conceived in 1953 by Edouard Wyss-Dunant, a Swiss doctor, in an article about acclimatization published in the journal of the Swiss Foundation for Alpine Research. Many deaths in high-altitude mountaineering have been caused by the effects of the death zone, either directly (loss of vital functions) or indirectly (wrong decisions made under stress, physical weakening leading to accidents). In the death zone, the human body cannot acclimatize. An extended stay in the zone without supplementary oxygen will result in deterioration of bodily functions, loss of consciousness, and, ultimately, death. Scientists at the High Altitude Pathology Institute in Bolivia dispute the existence of a death zone, based on observation of extreme tolerance to hypoxia in patients with chronic mountain sickness and normal fetuses in-utero, both of which present pO2 levels similar to those at the summit of Mount Everest. The summit of K2 is in the death zone. Studies have shown that the approximately 140 million people who live at elevations above 2,500 metres (8,200 ft) have adapted to the lower oxygen levels. These adaptations are especially pronounced in people living in the Andes and the Himalayas. Compared with acclimatized newcomers, native Andean and Himalayan populations have better oxygenation at birth, enlarged lung volumes throughout life, and a higher capacity for exercise. Tibetans demonstrate a sustained increase in cerebral blood flow, lower hemoglobin concentration, and less susceptibility to chronic mountain sickness (CMS). These adaptations may reflect the longer history of high altitude habitation in these regions. A significantly lower mortality rate is observed for permanent residents at higher altitudes. Similarly, a dose response relationship exists between increasing elevation and decreasing obesity prevalence in the United States. This is not explained by migration alone. On the other hand, people living at higher elevations also have a higher rate of suicide in the United States. The correlation between elevation and suicide risk was present even when the researchers control for known suicide risk factors, including age, gender, race, and income. Research has also indicated that oxygen levels are unlikely to be a factor, considering that there is no indication of increased mood disturbances at high altitude in those with sleep apnea or in heavy smokers at high altitude. The cause for the increased suicide risk is as yet unknown. The human body can adapt to high altitude through both immediate and long-term acclimatization. At high altitude, in the short term, the lack of oxygen is sensed by the carotid bodies, which causes an increase in the breathing depth and rate (hyperpnea). However, hyperpnea also causes the adverse effect of respiratory alkalosis, inhibiting the respiratory center from enhancing the respiratory rate as much as would be required. Inability to increase the breathing rate can be caused by inadequate carotid body response or pulmonary or renal disease. In addition, at high altitude, the heart beats faster; the stroke volume is slightly decreased; and non-essential bodily functions are suppressed, resulting in a decline in food digestion efficiency (as the body suppresses the digestive system in favor of increasing its cardiopulmonary reserves). Full acclimatization, however, requires days or even weeks. Gradually, the body compensates for the respiratory alkalosis by renal excretion of bicarbonate, allowing adequate respiration to provide oxygen without risking alkalosis. It takes about four days at any given altitude and can be enhanced by drugs such as acetazolamide. Eventually, the body has lower lactate production (because reduced glucose breakdown decreases the amount of lactate formed), decreased plasma volume, increased hematocrit (polycythemia), increased RBC mass, a higher concentration of capillaries in skeletal muscle tissue, increased myoglobin, increased mitochondria, increased aerobic enzyme concentration, increase in 2,3-BPG, hypoxic pulmonary vasoconstriction, and right ventricular hypertrophy. Pulmonary artery pressure increases in an effort to oxygenate more blood. Full hematological adaptation to high altitude is achieved when the increase of red blood cells reaches a plateau and stops. The length of full hematological adaptation can be approximated by multiplying the altitude in kilometers by 11.4 days. For example, to adapt to 4,000 metres (13,000 ft) of altitude would require 45.6 days. The upper altitude limit of this linear relationship has not been fully established. Athletes training at high altitude in St. Moritz, Switzerland (elevation 1,856 m or 6,089 ft). For athletes, high altitude produces two contradictory effects on performance. For explosive events (sprints up to 400 metres, long jump, triple jump) the reduction in atmospheric pressure means there is less resistance from the atmosphere and the athlete's performance will generally be better at high altitude. For endurance events (races of 800 metres or more), the predominant effect is the reduction in oxygen, which generally reduces the athlete's performance at high altitude. Sports organizations acknowledge the effects of altitude on performance: the International Association of Athletics Federations (IAAF), for example, have ruled that performances achieved at an altitude greater than 1,000 metres will be approved for record purposes, but carry the notation of "A" to denote they were set at altitude. The 1968 Summer Olympics were held at altitude in Mexico City. With the best athletes in the world competing for the most prestigious title, most short sprint and jump records were set there at altitude. Other records were also set at altitude in anticipation of those Olympics. Bob Beamon's record in the long jump held for almost 23 years and has only been beaten once without altitude or wind assistance. Many of the other records set at Mexico City were later surpassed by marks set at altitude. Athletes can also take advantage of altitude acclimatization to increase their performance. The same changes that help the body cope with high altitude increase performance back at sea level. However, this may not always be the case. Any positive acclimatization effects may be negated by a de-training effect as the athletes are usually not able to exercise with as much intensity at high altitudes compared to sea level. This conundrum led to the development of the altitude training modality known as "Live-High, Train-Low", whereby the athlete spends many hours a day resting and sleeping at one (high) altitude, but performs a significant portion of their training, possibly all of it, at another (lower) altitude. A series of studies conducted in Utah in the late 1990s by researchers Ben Levine, Jim Stray-Gundersen, and others, showed significant performance gains in athletes who followed such a protocol for several weeks. Other studies have shown performance gains from merely performing some exercising sessions at high altitude, yet living at sea level. The performance-enhancing effect of altitude training could be due to increased red blood cell count, more efficient training, or changes in muscle physiology. 1 2 3 Young, Andrew J; Reeves, John T. (2002). "Human Adaptation to High Terrestrial Altitude". Medical Aspects of Harsh Environments (PDF). 2. Borden Institute, Washington, DC. CiteSeerX 10.1.1.175.3270 . Archived from the original (PDF) on 2012-09-16. Retrieved 2009-01-05. 1 2 Darack, Ed (2002). Wild winds: adventures in the highest Andes. p. 153. ISBN 978-1-884980-81-7. 1 2 Huey, Raymond B.; Eguskitza, Xavier (2 July 2001). "Limits to human performance: elevated risks on high mountains". J. Experimental Biology. 204 (18): 3115–9. PMID 11581324. 1 2 Grocott, Michael P.W. ; Martin, Daniel S.; Levett, Denny Z.H. ; McMorrow, Roger; Windsor, Jeremy; Montgomery, Hugh E. (2009). "Arterial Blood Gases and Oxygen Content in Climbers on Mount Everest". N Engl J Med. 360 (2): 140–9. doi:10.1056/NEJMoa0801581. PMID 19129527. 1 2 3 Zubieta-Castillo, G.; Zubieta-Calleja, G.R. ; Zubieta-Calleja, L.; Zubieta-Castillo, Nancy (2008). "Facts that Prove that Adaptation to life at Extreme Altitude (8842m) is possible" (PDF). Adaptation Biology and Medicine. 5 (Suppl 5): 348–355. ↑ "Hypoxemia (low blood oxygen)". Mayo Clinic. Archived from the original on 2012-10-06. Retrieved 2011-12-21. ↑ "Introduction to the Atmosphere". PhysicalGeography.net. Retrieved 2006-12-29. 1 2 Muza, SR; Fulco, CS; Cymerman, A (2004). "Altitude Acclimatization Guide". US Army Research Inst. of Environmental Medicine Thermal and Mountain Medicine Division Technical Report (USARIEM–TN–04–05). Retrieved 2009-03-05. ↑ "Non-Physician Altitude Tutorial". International Society for Mountain Medicine. Archived from the original on 2011-06-06. Retrieved 22 December 2005. 1 2 Cymerman, A; Rock, PB. "Medical Problems in High Mountain Environments. A Handbook for Medical Officers". USARIEM-TN94-2. US Army Research Inst. of Environmental Medicine Thermal and Mountain Medicine Division Technical Report. Retrieved 2009-03-05. ↑ Fayed, N; Modrego, P.J. ; Morales, H (2006). "Evidence of brain damage after high-altitude climbing by means of magnetic resonance imaging," (PDF). The American Journal of Medicine. Elsevier. 119 (2): 168. doi:10.1016/j.amjmed.2005.07.062. ↑ Krakauer, Jon (1999). Into Thin Air: A Personal Account of the Mt. Everest Disaster. New York: Anchor Books/Doubleday. ISBN 978-0-385-49478-6. 1 2 West, JB (2002). "Highest permanent human habitation". High Altitude Medical Biology. 3 (4): 401–7. doi:10.1089/15270290260512882. PMID 12631426. ↑ Rose, MS; Houston, CS; Fulco, CS; Coates, G; Sutton, JR; Cymerman, A (December 1988). "Operation Everest. II: Nutrition and body composition". J. Appl. Physiol. 65 (6): 2545–51. PMID 3215854. Retrieved 2009-03-05. ↑ Kayser, B. (October 1992). "Nutrition and high altitude exposure". Int J Sports Med. 13 Suppl 1: S129–32. doi:10.1055/s-2007-1024616. PMID 1483750. ↑ Wyss-Dunant, Edouard (1953). "Acclimatisation" (PDF). The Mountain World: 110–117. Retrieved March 10, 2013. ↑ Moore, LG; Niermeyer, S; Zamudio, S (1998). "Human adaptation to high altitude: Regional and life-cycle perspectives". Am. J. Phys. Anthropol. 107: 25–64. doi:10.1002/(SICI)1096-8644(1998)107:27+<25::AID-AJPA3>3.0.CO;2-L. PMID 9881522. ↑ Moore, Lorna G (June 2001). "Human Genetic Adaptation to High Altitude". High Altitude Medicine & Biology. 2 (2): 257–279. doi:10.1089/152702901750265341. PMID 11443005. ↑ West, John B. (January 2011). "Exciting Times in the Study of Permanent Residents of High Altitude". High Altitude Medicine & Biology. 12 (1): 1. doi:10.1089/ham.2011.12101. ↑ Voss, JD; Masuoka, P; Webber, BJ; Scher, AI; Atkinson, RL (2013). "Association of Elevation, Urbanization and Ambient Temperature with Obesity Prevalence in the United States". International Journal of Obesity. 37 (10): 1407–12. doi:10.1038/ijo.2013.5. PMID 23357956. ↑ Voss, JD; Allison, DB; Webber, BJ; Otto, JL; Clark, LL (2014). "Lower Obesity Rate during Residence at High Altitude among a Military Population with Frequent Migration: A Quasi Experimental Model for Investigating Spatial Causation". PLoS ONE. 9 (4): e93493. Bibcode:2014PLoSO...993493V. doi:10.1371/journal.pone.0093493. PMC 3989193 . PMID 24740173. 1 2 Brenner, Barry; Cheng, David; Clark, Sunday; Camargo, Carlos A., Jr (Spring 2011). "Positive Association between Altitude and Suicide in 2584 U.S. Counties". High Altitude Medicine & Biology. 12 (1): 31–5. doi:10.1089/ham.2010.1058. PMC 3114154 . PMID 21214344. 1 2 Harris, N Stuart; Nelson, Sara W (16 Apr 2008). "Altitude Illness – Cerebral Syndromes". eMedicine Specialties > Emergency Medicine > Environmental. ↑ Bärtsch, P; Gibbs, JSR (2007). "Effect of Altitude on the Heart and the Lungs". Circulation. 116 (19): 2191–2202. doi:10.1161/CIRCULATIONAHA.106.650796. PMID 17984389. ↑ Westerterp, Klaas (June 1, 2001). "Energy and Water Balance at High Altitude". News in Physiological Sciences. 16 (3): 134–7. PMID 11443234. ↑ Zubieta-Calleja, G. R.; Paulev, P-E.; Zubieta-Calleja, L.; Zubieta-Castillo, G. (2007). "Altitude adaptation through hematocrit change". Journal of Physiology and Pharmacology. 58 (Suppl 5(Pt 2)): 811–18. ISSN 0867-5910. ↑ Ward-Smith, AJ (1983). "The influence of aerodynamic and biomechanical factors on long jump performance". Journal of Biomechanics. 16 (8): 655–8. doi:10.1016/0021-9290(83)90116-1. PMID 6643537. ↑ Levine, BD; Stray-Gundersen, J (July 1997). ""Living high-training low": effect of moderate-altitude acclimatization with low-altitude training on performance". Journal of Applied Physiology. 83 (1): 102–12. PMID 9216951. Retrieved 2009-01-05. ↑ Stray-Gundersen, J; Chapman, RF; Levine, BD (September 2001). ""Living high-training low" altitude training improves sea level performance in male and female elite runners". Journal of Applied Physiology. 91 (3): 1113–20. PMID 11509506. Retrieved 2009-01-05. ↑ Dufour, SP; Ponsot, E.; Zoll, J.; Doutreleau, S.; Lonsdorfer-Wolf, E.; Geny, B.; Lampert, E.; Flück, M.; Hoppeler, H.; Billat, V.; Mettauer, B.; Richard, R.; Lonsdorfer, J. (April 2006). "Exercise training in normobaric hypoxia in endurance runners. I. Improvement in aerobic performance capacity". Journal of Applied Physiology. 100 (4): 1238–48. doi:10.1152/japplphysiol.00742.2005. PMID 16540709. Retrieved 2009-01-05. ↑ Levine, BD; Stray-Gundersen, J (November 2005). "Point: positive effects of intermittent hypoxia (live high:train low) on exercise performance are mediated primarily by augmented red cell volume". Journal of Applied Physiology. 99 (5): 2053–5. doi:10.1152/japplphysiol.00877.2005. PMID 16227463. Retrieved 2009-01-05. ↑ Gore, CJ; Hopkins, WG (November 2005). "Counterpoint: positive effects of intermittent hypoxia (live high:train low) on exercise performance are not mediated primarily by augmented red cell volume". Journal of Applied Physiology. 99 (5): 2055–7; discussion 2057–8. doi:10.1152/japplphysiol.00820.2005. PMID 16227464. Retrieved 2009-01-05. ↑ Bigard, AX; Brunet, A; Guezennec, CY; Monod, H (1991). "Skeletal muscle changes after endurance training at high altitude". Journal of Applied Physiology. 71 (6): 2114–21. PMID 1778900. ↑ Ponsot, E; Dufour, S.P. ; Zoll, J.; Doutrelau, S.; N'Guessan, B.; Geny, B.; Hoppeler, H.; Lampert, E.; Mettauer, B.; Ventura-Clapier, R.; Richard, R. (April 2006). "Exercise training in normobaric hypoxia in endurance runners. II. Improvement of mitochondrial properties in skeletal muscle". J. Appl. Physiol. 100 (4): 1249–57. doi:10.1152/japplphysiol.00361.2005. PMID 16339351. Retrieved 2009-03-05. IPPA, High Altitude Pathology Institute.